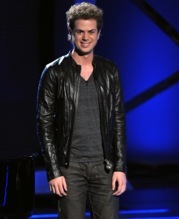 After a weak performance on Tuesday night, Scott MacIntyre’s American Idol dream ended on Wednesday. MacIntyre received the lowest number of votes this week after Anoop Desai, and the four judges, although they said they had a 2-2 tie on whether to save MacIntyre, voted not to save him, which would have allowed him to remain on the show. In MacIntyre’s rendition of Survivor’s The Search Is Over, he chose to play electric guitar instead of his usual piano. Some of the lyrics sounded “screeched,” according to the judges, including Simon Cowell, who admonished him for not staying behind the piano — where he performs best. Still, MacIntyre raised awareness of the challenges of blindness with his talent. He’ll join the Top 10 on the American Idol Summer Tour, and says he won’t give up his dreams of being a recording artist. On the American Idol website, Scott said if he had 24 hours to do anything he wanted, he would “shoot a music video of me singing and playing a grand piano atop the Eiffel Tower.” That vision suits him perfectly, and I hope to see it someday.